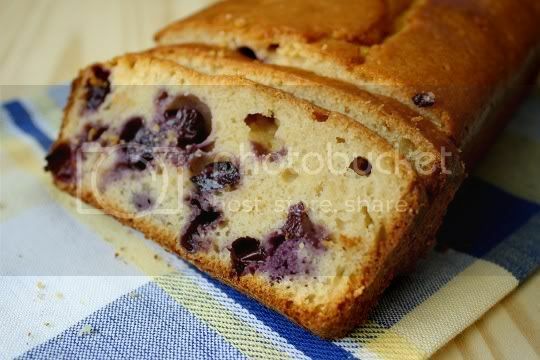 A summery breakfast treat, this loaf-pan cake combines the classic combination of blueberries and lemons...and it's big on flavor for both fruits. The cake is literally bursting with sweet and juicy blueberries that seem to plump during baking, topped off with a sweet, tangy, mouthwatering lemon glaze. The cake itself isn't overly sweet, but the glaze and berries definitely make up for that. Both the cake and glaze contain a bit of an adult "kick" (thanks to Cointreau), but there's no alcohol taste whatsoever, just extra lemon flavor. You can probably use Grand Marnier for even more sweetness. The recipe is pretty easy to make, although I'd HIGHLY suggest cutting down the baking time. Seventy minutes is suggested, but I found this to be a bit much, as my end result was a little browner (with tougher edges) than I would have liked...thus making it a bit more dense than what's probably the norm. So, try 60 minutes, then check every 5 minutes or so. Still, the cake is super rich and moist, thanks to Greek yogurt (you can probably substitute sour cream) and grapeseed oil (you can try canola or another flavorless oil...grapeseed is a bit expensive, and it doesn't taste like grapes) in the batter; it has a cakey texture with a bit of crunch from added cornmeal. Make again? Yes...with reduced baking time. 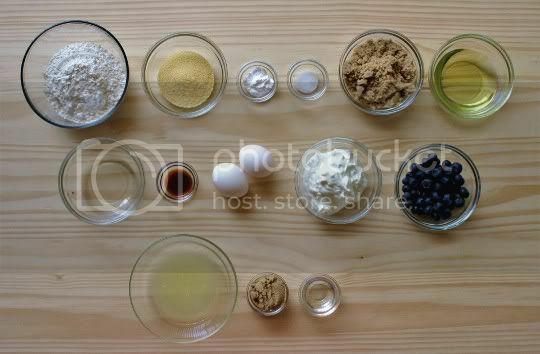 This might even be fun to try as muffins. Vegan variation: Use egg replacer and soy yogurt or sour cream. 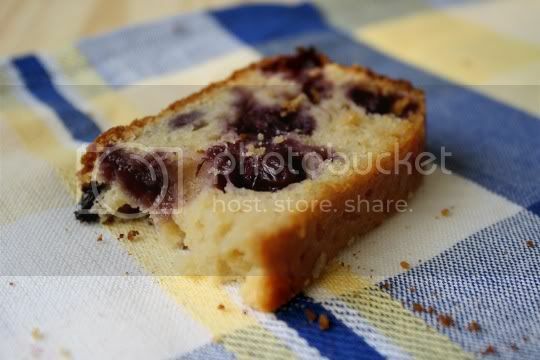 Your blueberry lemon cake sounds amazing! Love the addition of Cointreau. The glaze does sound like the perfect final touch. Great pictures! That looks divine!!! Yum!